Congratulations to Dare Sholanke, recipient of the 2018 Elizabeth Henry Scholarship! Dare is a Masters student in the Department of Geography, University of Victoria. 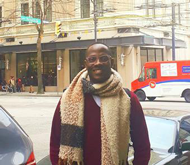 His current research under the supervision of Dr. Jutta Gutberlet seeks to map waste governance in relation to the informal recycling sector, with the aim of empowering marginalized individuals who contribute immensely to environmental sustainability through waste recovery. The Fraser Basin Council is a non-profit, charitable organization that works to advance sustainability in the Fraser Basin and across BC. This is possible thanks to our partners, funders and supporters. Learn about our services and opportunities to be part our work. Web Poll: What do you think of our site? Take our web poll to tell us what you think of the FBC website ― and the features you’d like to see. 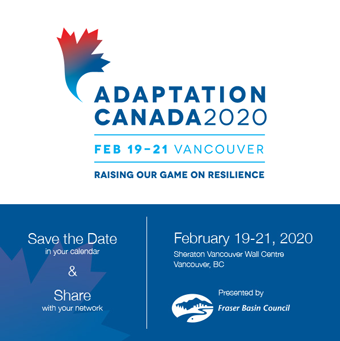 Canada’s national conference on climate change adaptation is coming to Vancouver February 19-21, 2020. You can be a key part of its success! ADAPTATION CANADA 2020 will bring together experts and leaders from across sectors and regions to work on one of the most urgent issues of our time — how to build climate change resilience in our communities, ecosystems and economies. Learn more & updates! Sponsorship opportunities are now available too! Looking for a quick synopsis of FBC's work over the past year? 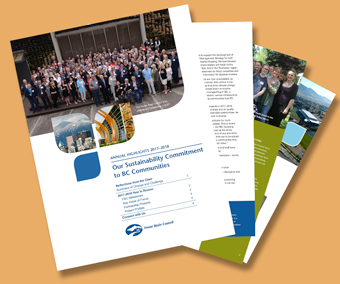 Check out our 2017-2018 Annual Highlights report, including Chair Colin Hansen's column on how FBC is serving BC communities in tackling climate change challenges. Electric vehicles (EVs) are a good choice for Canadians who drive and are looking for more climate-friendly options. While EVs can require up to twice as much energy (and create double the greenhouse gas emissions) as gasoline vehicles during the manufacturing process, emissions from driving are significantly lower. According to a recent life cycle analysis, a mid-size battery-electric sedan, such as the Nissan Leaf, charged up on BC’s clean energy grid, will make up for the initial manufacturing impact after 30,000 km, or about three years of driving. After that, the vehicle produces no further emissions. Over 15 years of driving, assuming 10,000 km per year, the EV generates 99% fewer emissions in operation than a gas vehicle; the EV generates 73% fewer emissions when both manufacturing and driving are taken into account. To achieve even further emissions reductions, it is critical to have a commitment to the effective recycling of EV batteries. It is important to recover and reuse most battery construction materials and to displace raw materials that would otherwise need to be mined. Find a summary of the Plug in BC analysis in Policy Options magazine. Kanaka Bar is on a path to self-sufficiency, which encompasses such areas as employment, food and energy. In addition to solar and small-scale hydroelectric development, the community is putting a lot of effort into renovating homes so that they use less energy and are more comfortable. 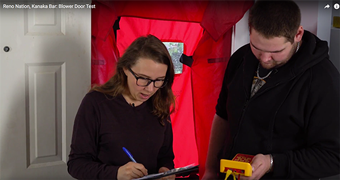 Watch Reno Nation, Kanaka Bar, a series of three short videos that offer tips and techniques for improving home energy efficiency. The Fraser Basin Council provided support for these projects through the First Nations Home EnergySave Program. 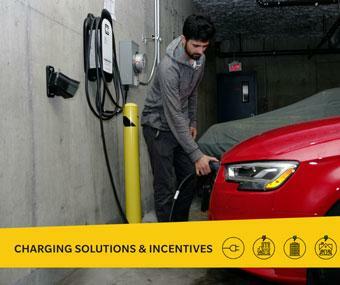 If you’ve been thinking about buying an electric car, new charge-up incentives may give you the boost you need. 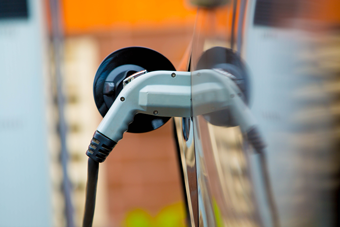 On March 7, 2018 the Fraser Basin Council announced rebates in its Plug in BC program to help offset the purchase and installation of electric vehicle charging equipment in single-family homes, duplexes and multi-unit residential buildings and – for the first time – in workplaces. The incentives are funded by the Province of BC. See our media release: Word |PDF. For full details on the incentives and how to apply, visit Plug in BC. Our 2016-2021 Strategic Plan: Advancing Sustainability Solutions will help guide the Fraser Basin Council into our third decade of service. The five-year plan reflects the Council’s strategic priorities, the way in which we carry out our work and how we define our success. Inspirational and practical, this is the framework for annual operating plans, partnerships, work plans and all decisions to devote time, money and energy to fulfillment of the Fraser Basin Council’s mandate. Take a look. FBC's Youth Program is currently seeking climate stories from youth in BC to profile on an interactive, online storymap called My Climate Story. If you are 30 years old or younger and have a story to share, please provide a brief summary by filling this survey. Congratulations to our two winners of the Salmon-Safe BC Design Competition for Urban Development: DIALOG Design and Mountain Equipment Co-op! This competition was a key opportunity for progressive landowners and developers to bring to life their design solutions for responsible land and water management through two prizes of $6,000 each towards the cost of a Salmon-Safe assessment and certification. The assessment includes technical support to implement low-impact development solutions and meet Salmon-Safe urban standards on the site to address land and water impacts. Phase 2 of the Lower Mainland Flood Management Strategy is underway. 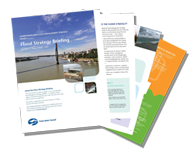 All partners, participants and others interested in progress on the Strategy will want to read the May 2018 Flood Strategy Briefing.